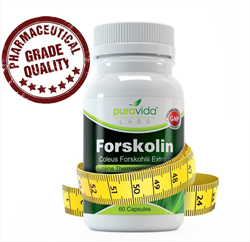 Natural supplement company, PuraVida Labs, announces 25% off on its new Forskolin supplement that is proven to help people lose weight. With application of its well-documented physiological effects on the circulatory system, new uses for Forskolin begin to emerge constantly. Long known as a potent vasodilator, Forskolin is lately being used successfully for weight loss, fat burning, lowering blood pressure, increasing metabolism and even for relief from asthma and painful menstrual cramps. There are a lot of herbal supplements on the market that claim many benefits, some proven, some imagined. At times the smell of snake oil can be strong. But one of the increasingly impressive herbal remedies backed by scientific research comes from a relative of the mint family and has been used for centuries in Nepal, India and Thailand as a powerful vasodilator, sometimes even given intravenously for heart failure. The active chemical is called Forskolin, derived from the plant Plectranthus Barbatus (Coleus Forskohlii) or “Indian Coleus,” and research continues to reveal new uses almost weekly. It is widely recommended as a weight loss supplement, due to its combined effect of raising metabolism and promoting the breakdown of stored cellular fats. One of the most potent and purest Forskolin extracts is produced by PuraVida Labs, whose tablets contain 20% pure pharmaceutical grade forskolin in 250mg doses. It is generally recommended that to derive the best results from Forskolin to use 250mg Forskolin and take 1 capsule twice per day 20-30 minutes before a meal. Most people take one before breakfast and one before dinner. To celebrate the release of PuraVida Labs Forskolin supplement, the company is offering 25% off with the coupon code ZZYPTQ22 for a limited time. With application of its well-documented physiological effects on the circulatory system, new uses for Forskolin begin to emerge constantly. It has been proven to help with asthma when inhaled. Its effect on the circulatory system can help bring relief from painful menstrual cramps. It is being used now by male bodybuilders due to its effect of increasing lean mass, bone mass and testosterone. It is useful in treating high blood pressure and is even used in other countries as a first response to heart failure, by injecting Forskolin intravenously. PuraVida Labs produces its extract in a GMP-certified and FDA-registered facility. The product is 100% vegetarian and non-GMO. With its non-interactive qualities, Forskolin is often recommended as a companion supplement to be used with Garcinia Cambogia, Green Coffee Bean Extract, CLA 1250, Raspberry Ketones, Yacon Syrup and Hydroxycut. PuraVida offers a staff nutritionist to answer customer questions and provide email support free of charge. PuraVida Labs also stands behind their product by offering customers a 100%, no questions asked money-back guarantee. The company extends that guarantee for a full year after purchase which is relatively unheard of in the supplement industry.